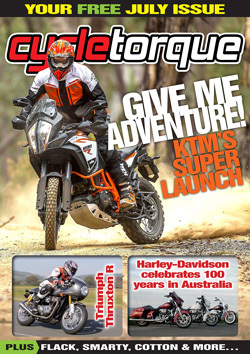 CYCLE TORQUE MAGAZINE, JULY 2017 – On the cover of this issue is KTM’s 1290 Super Adventure: Cycle Torque went to the Australian media launch of the three go-everywheres. There’s the big dirtbike – the 1090 Adventure R; traverse the globe on the 1290 Super Adventure R; and the all-roads 1290 Super Adventure S.
Also tested in the Issue is the Triumph Thruxton R, Hinckley’s café racer 2.0 and it goes as good as it looks. We hit the road and check out Harley-Davidson’s 100th birthday in OZ. Cotton lampoons sports-tourers, Flack takes the Old Road, Smarty talks starts and we meditate on electronic developments. There’s plenty of news, products, reviews and more.